I haven’t exactly been “burger free” since my last post… but this salad is satisfying, packed with nutrition & proves healthy food can taste almost better than a burger. It’s also gluten free & vegetarian. I’ve never made a quinoa salad but I’ve tasted plenty. The good ones seem to have very flavorful dressings, texture and the right balance of savory and sweet. This recipe has a Mediterranean flair and minus the olives is very similar to a greek salad. I threw in some dried sour cherries but feel free to use any dried cherry, cranberry or craisin. In a medium saucepan, combine the quinoa with 2 cups water and bring to a boil. Cover and simmer over low heat until the water is absorbed and the quinoa is tender, about 17 minutes. Uncover, fluff with a fork and let cool slightly. In a small bowl, whisk olive oil with lime juice, vinegar & agave nectar. Season with salt and black pepper. Set aside. 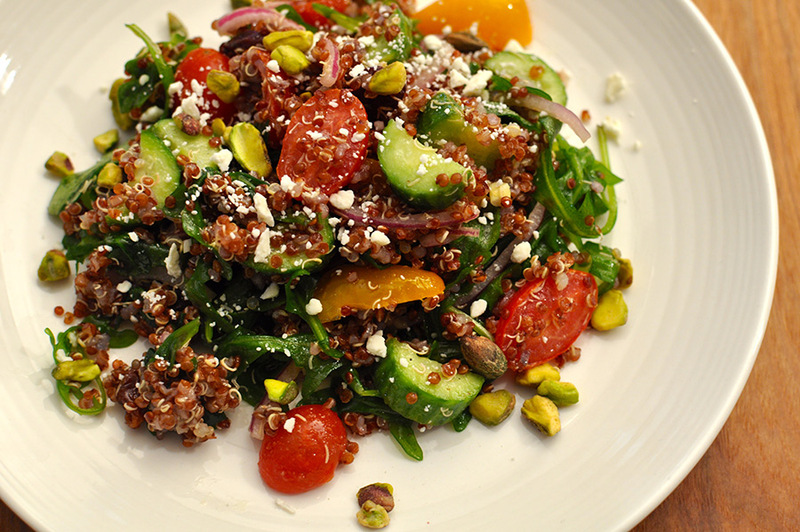 In a large bowl, add all of the salad ingredients, except for the feta & pistachio. Add cooled quinoa. Add the dressing and toss to coat. Top with crumbled feta & pistachios before serving.